Top Hat - winner of three Olivier Awards, for ‘Best New Musical’, ‘Best Choreography’, ‘Best Costume Design’ from its seven nominations - is enjoying an epic 47-week UK tour, visiting 24 theatres nationwide. 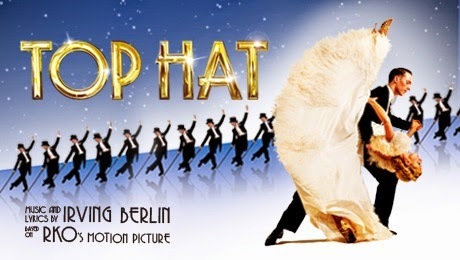 From Tuesday 2 December Top Hat will bePuttin’ on the Ritz at the Theatre Royal Glasgow. The world premiere stage production of Top Hat opened in the West End at the Aldwych Theatre on 9 May 2012 where it played over 600 performances during its run of nearly two years. Prior to the West End, the production previously enjoyed a sell-out UK Tour in 2011. Stepping into the shoes of Fred Astaire and Ginger Rogers in the lead roles of Jerry Travers and Dale Tremont, are Alan Burkitt andCharlotte Gooch, who both return to Top Hat having previously performed these roles in the West End. They are joined by Clive Hayward who returns as Horace Hardwick, the role he played in the West End, Rebecca Thornhill as Madge Hardwick, Sebastien Torkia as Alberto Beddini and John Conroy as Horace’s valet Bates. Performed by a cast of 29 and accompanied by 11 live musicians, this multi award-winning musical comedy includes Irving Berlinclassics from the movie such as Cheek to Cheek, Isn’t It a Lovely Day to be Caught in the Rain and Top Hat, White Tie and Tails. In addition, from Berlin’s 1200 strong back catalogue, a further ten numbers have been interpolated including well-loved favourites Let’s Face the Music and Dance and Puttin’ On the Ritz.